As Obama pivots to Asia, is regional ally pivoting to China? MANILA, Philippines -- Philippine President Rodrigo Duterte said Tuesday he won’t allow government forces to conduct joint patrols of disputed waters near the South China Sea with foreign powers, apparently scrapping a deal his predecessor reached with the U.S. military earlier this year. Duterte also said he was considering acquiring defense equipment from Russia and China. The Philippines has traditionally leaned on the U.S., its longtime treaty ally, and other Western allies for its security needs. U.S.: Chinese jet approached in "unsafe manner"
The remarks were the latest from a Philippine president who has had an uneasy relationship with the U.S. but also has tried to mend relations with China strained over South China Sea disputes. Duterte said he wanted only Philippine territorial waters, up to 12 nautical miles offshore, to be patrolled by Filipino forces, but not other offshore areas that are contested. He added he opposes Filipino forces accompanying foreign powers like the U.S. and China in joint patrols which could entangle the Philippines in hostilities. 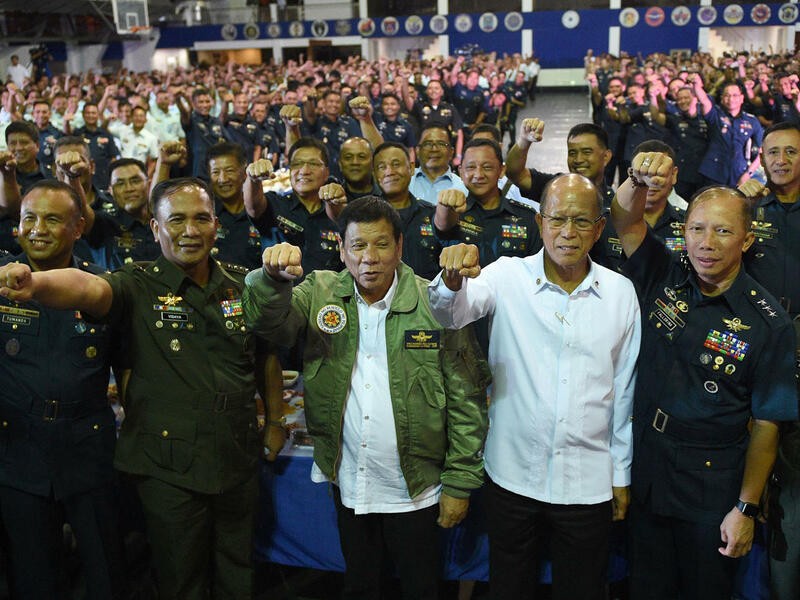 Like other security pronouncements, Duterte did not provide details, but his rejection for joint patrols apparently goes against such an arrangement announced in April by the U.S. and the Philippine defense chiefs. While visiting Manila, U.S. Defense Secretary Ash Carter disclosed for the first time in a news conference with then Philippine Defense Secretary Voltaire Gazmin that U.S. ships had carried out sea patrols with the Philippines in the South China Sea, a somewhat rare move. On Monday, Duterte said he wanted U.S. military forces out​ of the southern Philippines and blamed America for inflaming local Muslim insurgencies, in his first public statement opposing the presence of American troops in a part of the country. Washington later said it had not received a formal request to remove U.S. military personnel. White House spokesman Josh Earnest said Duterte had a tendency to make “colorful comments” and drew a comparison with Republican presidential nominee Donald Trump. In an apparent aim to prevent potential damage in relations, Philippine officials said Duterte wanted the Americans out of the south for fear of their safety. “He desires that our American counterparts should be eased from harm’s way,” the Philippine military said, adding about 100 U.S. military personnel were in the south to provide counterterrorism advice support to Filipino forces.